Thus, sea bass, mussels, or prawns in Puglia (Adriatic Sea) will have a different taste from those of Sicily (Mediterranean Sea). This is also true for fruit and vegetables, depending on the soil in which these fruits and vegetables are grown. Who has not heard (at least in America) of Maine Lobster? Does the word Norwegian salmon say something to you? These are examples of places renowned worldwide for the characteristic flavour of a particular type of seafood found in there. In the end, it’s all a matter of flavor, and when it comes to seafood, Italians – and I – are very picky. If I have to be a purist, Main lobster or Norwegian salmon should be eaten locally – in Maine and Norway respectively! For example, in Italy you can find Pacific Ocean tuna or shellfish (and they are usually cheaper than the local ones), but there is nothing like eating freshly catched, local tuna or shellfish (zero-kilometer)!! I’m willing to pay more but eat fresh. It is also a matter of trade-offs: eating fresh versus eating less often, in other words – quality versus quantity. When we go out for seafood, we go to places that we are sure we are eating local and fresh products. 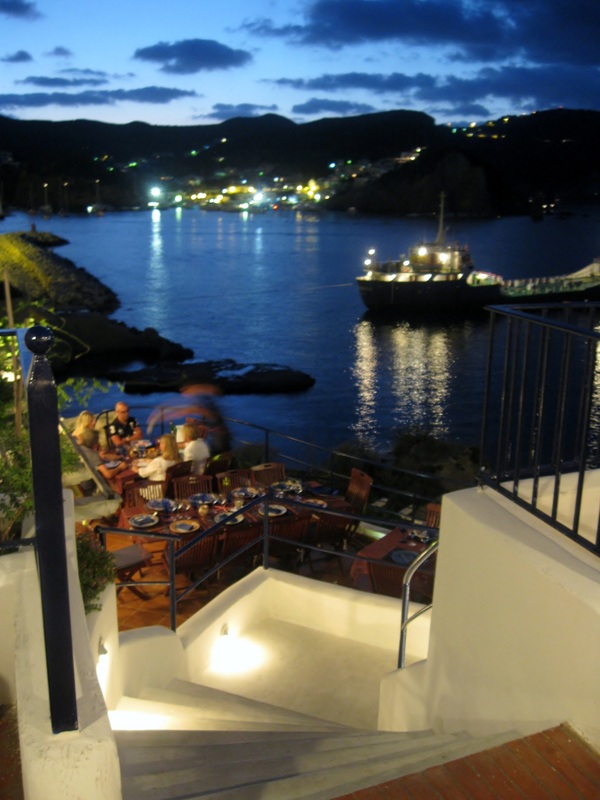 This is the case of the wonderful “Orestorante”, a three- story restaurant with great food and a stunning view of Ponza. 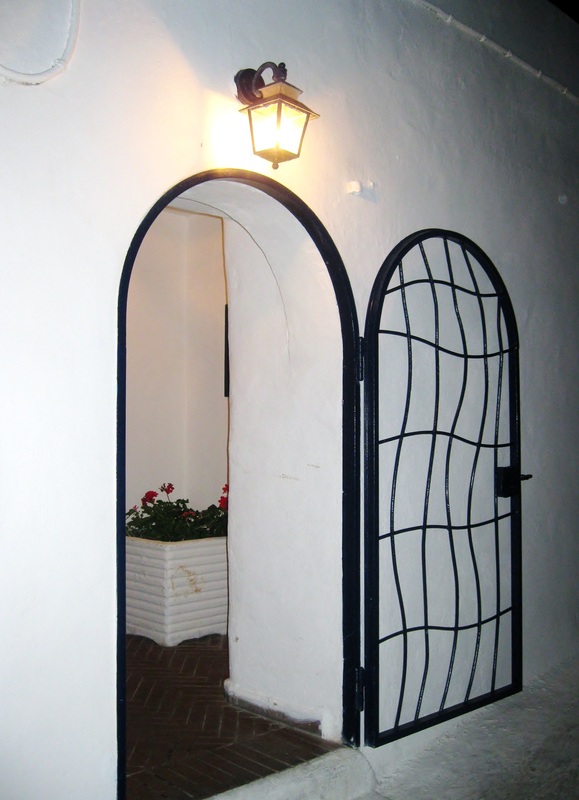 The entrance of the restaurant – simple and elegant. 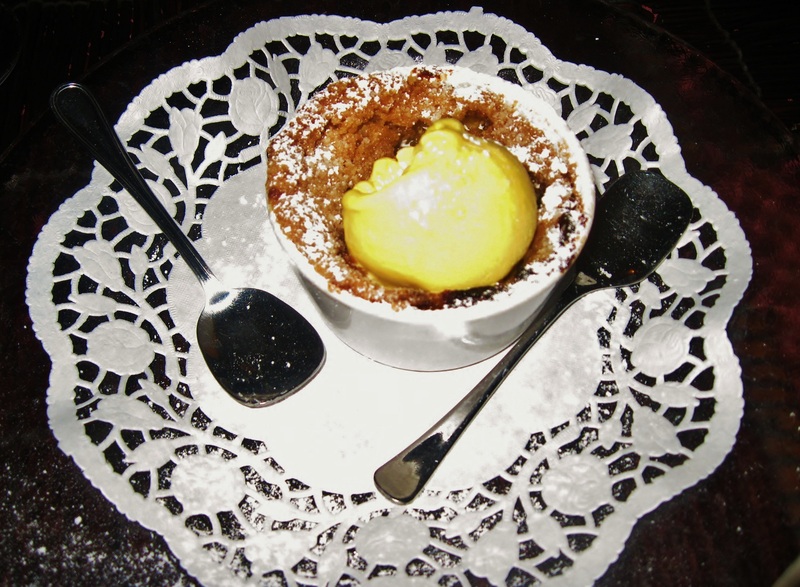 Orestorante’s name is a pun, a wordplay that mixes up two things: the chef’s name “Oreste” and the word “restaurant”. Upon our arrival to Orestorante (or Oreste’s Restaurant), the first thing I said was: “¡Que bella vista!” (meaning in Spanish what a beautiful view!). I was so excited that my hands were shaky, therefore the result was the picture below (apologies to you all!). Anyway, I still wanted to share the stunning colors of this “Bella Vista”!!! 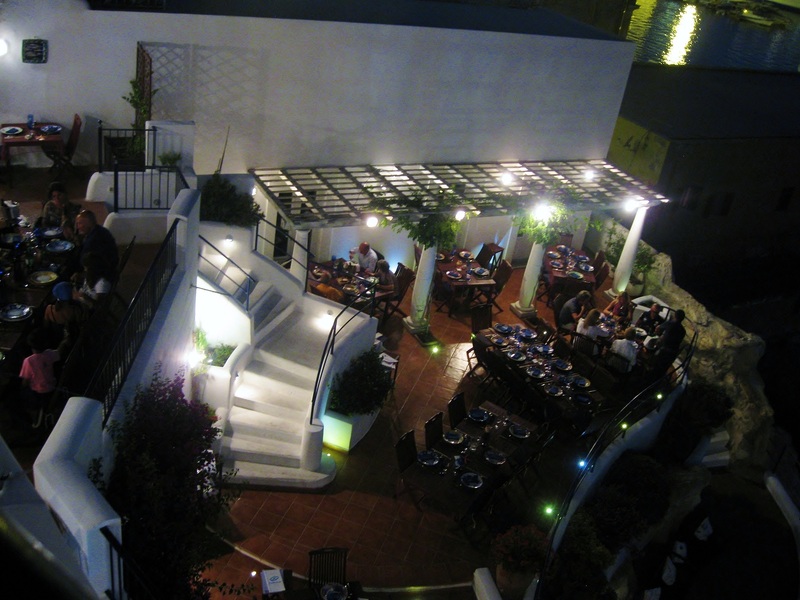 As I said before, the restaurant is in a three-story building with terraces featuring marvelous views. In the picture below, you can appreciate the first-story terrace and the second story terrace on your left. This is the view from our table, located at the rooftop terrace. Notice the fishing net used as table-cloth adding a quirky touch to the dining area. Our appetizer was a salad made of Greater Amberjack, prawns, and sea bass with a lime dressing, and a sea urchin sauce. Ok, so… I had an issue here: is food supposed to have a blue color? When I asked the waiter about the blue color sauce (it was bothering me! ), he told me it was intended to resemble the sea. Well, these are the kind of things that make you go…. Hmmmmm!! 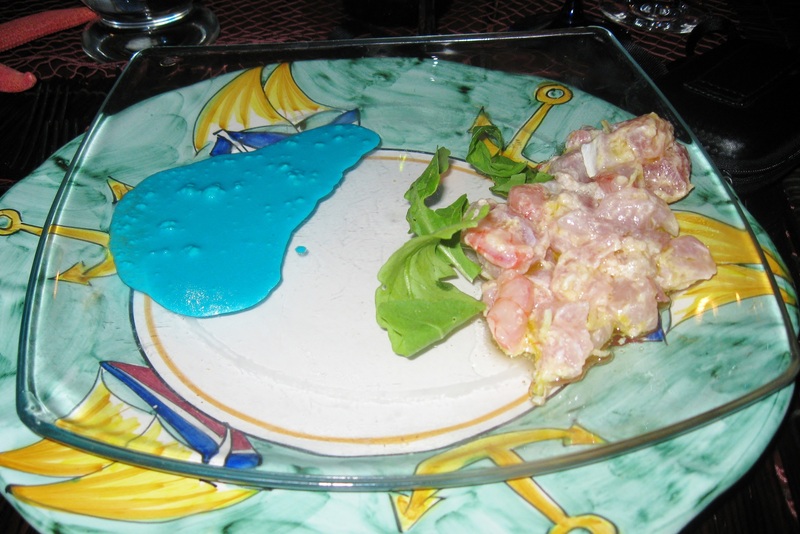 I like the blue color of the sea, but not in my food!!! I then thought: the old saying “don’t judge a book by its cover” probably applies here, so I gave it a try….and it was DEEEEEEEEEEEElicious!! 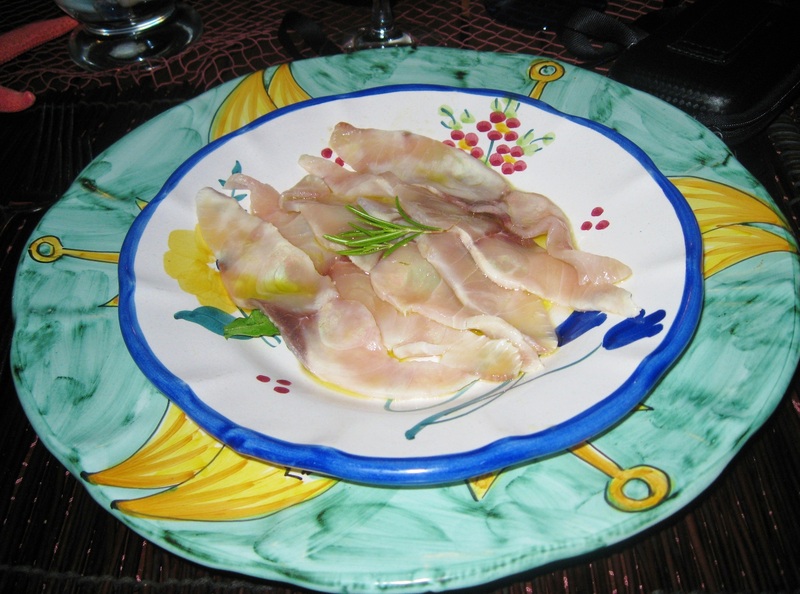 The second appetizer was more on the classic side: Carpaccio of Greater Amberjack infused with rosemary. 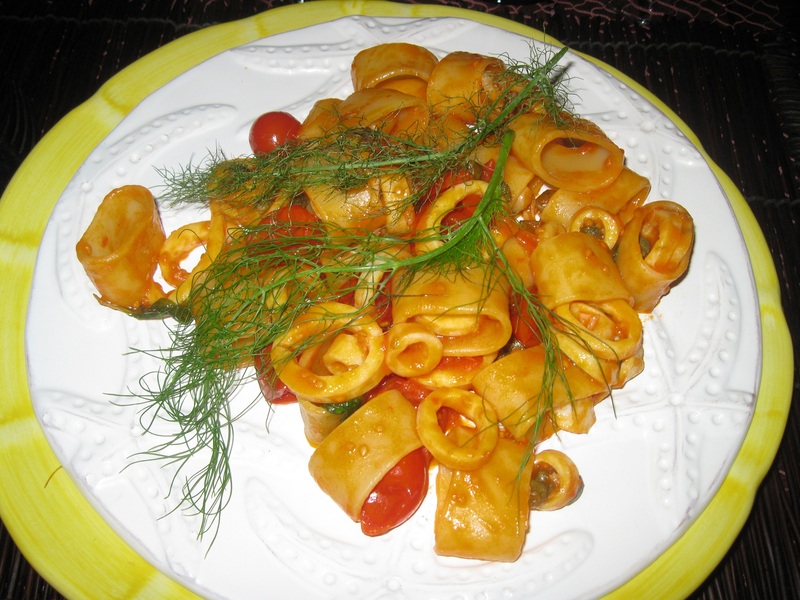 Our pasta course: Calamarata with fresh calamari, cherry tomatoes, capers, and finochietto (fennel foliage). Calamarata is a pasta format resembling – of course – calamari. 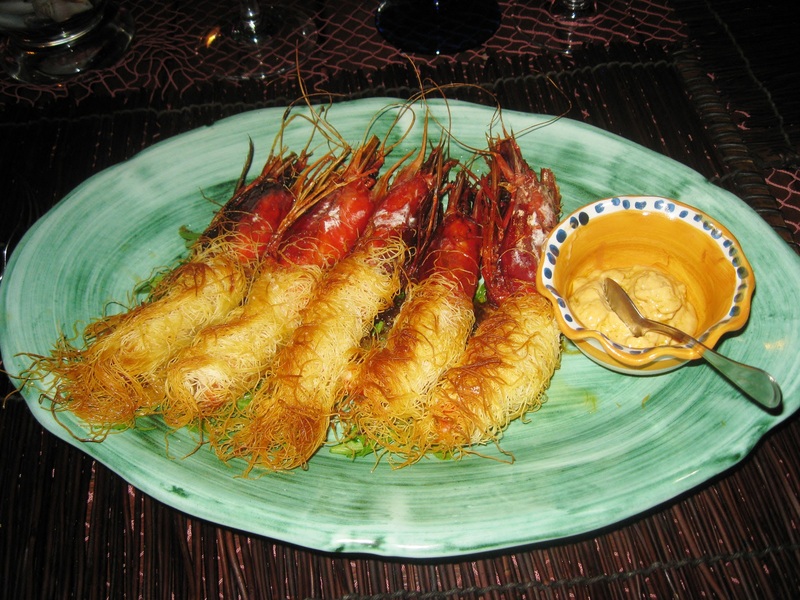 Main course – Filo Shrimp — five big shrimp wrapped in kataifi, deep-fried, and served with a light sea urchin mayonnaise. Kataifi, a traditional ingredient in Greek and Mediterranean desserts (such as baklava), is a style of phyllo pastry that looks like capellini spaghetti, and when deep-fried, it resembles shredded wheat cereal. Dessert: Apple crumble with cream gelato. Even without the amazing view, Orestorante would still be a great spot. It is very easy to find restaurants with wonderful views but with lousy food and service. This one is an exception to the rule – just outstanding! 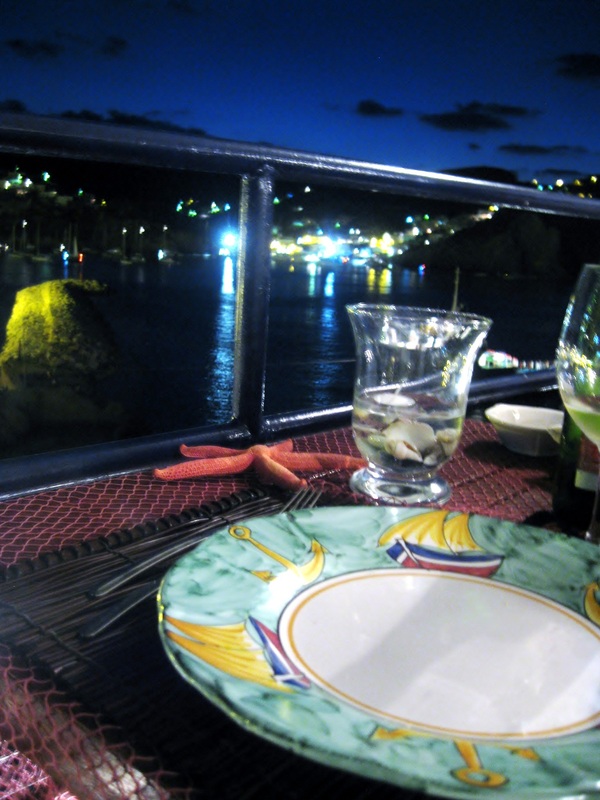 What a wonderful dinner you enjoyed and with such a spectacular view! You must’ve hated to leave so beautiful a place. I probably would have been teary-eyed. Thank you for sharing your trip with us. It was indeed wonderful and I was very sad when I left this paradise!! What a wonderful view and a wonderful dinner. The dishes look exquisite. Greater amberjack is a fish named ricciola in Italy. We are now heading south of Rome and then north! It is a surprise so I’ll keep you posted!! I’m in love with Ponza – I think you should say less about it so it stays as fabulous as it looks. Jejejeje that is true. When you excessively advertise a place, it is no longer a secret and becomes turisty. Oh, this food, view, and restaurant looks amazing! Glad to hear you had such a wonderful dinner! Not many restaurants have a view like that and the food looks wonderful. Thanks for giving us a taste! You are welcome!! I am glad you liked it!! Shaky hands or not, that view is amazing! As blue as the blue sauce on your plate! I’m with you on that one, it is a bit odd but nonetheless it is all so beautiful and I completely take your word on the great taste of all the food! I so love the Chef’s intro to the restaurant; it sounds like how Italians live. And might I add, you live a real dream to me!! That is true, Italians have a high quality of life!! They just enjoy it!! What a lovely restaurant you selected. What wonderful memories you will have, especially of that view. When we lived in Key Largo, Florida, my husband caught Amberjack often when fishing. He would have it smoked and then he made a smoked fish spread. It was delicious. I have never been to Key Largo – only to Key West – but it must be an amazing place!! !